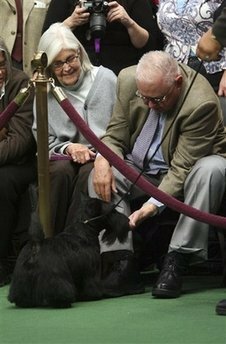 Congratulations to Sadie and the Musser family for Sadie’s victory as Best in Show at the Westminster Dog Show yesterday. Dan and Amelia Musser Sadie’s owners, also own Grand Hotel on Mackinac Island, Michigan. I have often seen Amelia Musser walking her dogs around Grand Hotel, and Sadie often gets to enjoy room service at the hotel. Sadie appeared on Good Morning America today and she will be on MSNBC at 9:00 a.m. tomorrow to open the New York Stock Exchange. President Obama should also invite Sadie for a visit to the White House and a play date with Bo. It would be only fair to reciprocate as in August 2008 the Musser family kindly contributed the use of the Gate House restaurant on the grounds of Grand Hotel for a Mackinac for Obama fund raiser. Posted in Sports and Games. Tags: Grand Hotel, Mackinac, MSNBC. RSS feed for comments on this post.. TrackBack URL. Congratulations Sadie! Scotties around the world hold your head high! Sadie is a great champion, but I must admit that I was pulling for the Doberman. I had mixed feelings. Living with two Cairn Terrier i was also pulling for one of their relatives to win, but ultimately I had to go with the one dog I’ve actually seen in the real world.